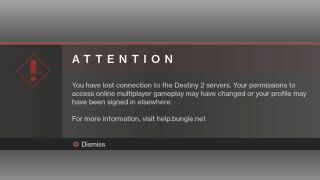 Destiny 2 is experiencing a server connection error on PS4 at the moment. Players are unable to login, with a message about online multiplayer permission and profile sign ins. At the moment there's not a lot anyone can do except wait (the PlayStation helpline is promising a resolution within 24hrs). Some other online games are experiencing minor issues, but Destiny 2 seems the worst affected - not surprising considering it's probably got the most people trying to access it right now.